A Guest Post by Sondra Pyrch from ShinyBlackApple Photography. Not every beginner photographer is familiar with white balance concept and use. And it was the same case for me when I started to get into photography. White Balance assist you to get the colours in your images as precise as possible. There are a few ways how you can adjust your white balance and make your pictures look more natural. In this tutorial I will focus on the easiest way that you can be 100% sure you will get your white balance right. And it is using grey card. All you need to have is a grey card either purchased from a photography gear shop or you might have some neutral grey paper yourself (make sure it’s non reflective though). I got my grey card from calumets (cost me around £20 pounds) and it came in two different sizes plus included grey and white references and black point handy for brightness/contrast adjustments (Amazon have a large range of Grey Cards starting at just a few dollars). Once you got your grey card then your life gets much easier in post processing. First you save lots of time without the need to adjust every picture and second you are able to batch process in seconds the rest of the pictures taken in the same light condition. So let’s get started! This method is so quick and easy to do. Once you turn your camera on – check your white balance on the camera is set to match closest the lighting type. You need to look for a button on your camera with two capital letters WB and it is usually placed on the top right of canons near LCD screen and top left of Nikons. Press WB and set it to the appropriate light situation. If however you are not sure what white balance option to use – the best option then is to leave it set to “auto white balance”. All you need to do is take a picture with gray card in that picture every time the light situation or the shooting location changes. You can either ask your subject to hold it or place it near it if it is still object. When you upload the images on your computer and start retouching them – first thing to do is load a selection of same lighting situation pictures in camera raw (I am using adobe photoshop plugin for camera raw and I always shoot in raw), then find the picture with gray card and select the white balance tool from the top panel of camera raw tools and click on the gray card in your picture. In the matter of a second it will adjust your white balance and correct the colors. All you need to do then is just synchronising all the other pictures in the open selection and voila! Very quick and easy to batch process loads of images. You can use this technique in Lightroom as well. I really hope this quick tutorial has helped you to save lots of time in Post Processing and getting better quality images to your clients. I am always using this technique when I am shooting outdoors and weddings as I can be sure my white balance using grey card will be correct. Sondra and Richard are professional photographers and a couple at ShinyBlackApple Photography studio based in Machester and Cheshire, United Kingdom specializing in family, children, baby, newborn, maternity and wedding photography. ShinyBlackApple Photography Blog. Evidently this is now the hot setup for videos, too. Perhaps you can't see the color balance difference working with one camera, but when doing 2 or more cameras in video of a single scene, it is nice to be able to match their color balances. I just dug out my old Kodak grey cards, which I bought for metering back when we used this stuff called "film", and will now try them for digital photography white balance. I have heard professional photgraphers say that a cheap grey card from a photograph suppliers (mine is a kodak one ) is of little value.Does anybody here consider it worth paying a lot more for a professional one? I understand the concept but the execution explanation is gobblediguk. Plug-ins - When you re touch? CMYK equivalent for 18% Grey according to Digitalimageflow.com is 0,0,0,50. For a RGB value of 128, 128, 128 the equivalent Hex is #808080.
to translate between the commercial brands of paints. but I guess it doesn't really matter that much in actual use. You can bring these specifications to any Dulux shop and they can make it up for you. Please note that paint when dried is deeper in color than the paint in the pot. For those who live in Australia and would like a free grey card, go to diysplash.com.au and click samples. You will find Titan is very close to the 18% Grey card from Digital Image Flow. You can order free samples and there is Arctic White and Carbon you can use for the White and Black references. Eric --That is the best advice I have for ages and I will definitely try it out tomorrow.What a simple solution!! Gray cards are definitely a good idea, but here's an easier (IMO) and cheaper method. I shoot Canon, but I assume this is possible with a Nikon, too. Keep a sheet of plain white printer paper in your camera bag. When you get to a location, take a shot of the piece of paper, allowing it to fill the entire frame. Then set the custom white balance of your camera to this shot (this is done in the camera menu). This will tell your camera to interpret this color of white (however warm or cool it is) as absolute white. Finally, set your camera's WB to custom. You'll have a perfect WB every time and not have to worry about tweaking it much in post. The one thing that could throw off a perfect white balance is the color of the paper; some paper might be a little warmer or a little cooler. To fix this, just decrease/increase the color temp accordingly by the same amount across all of your shots in post. On a side note, I'd argue that very very small differences in white balance aren't worth worrying about at all. Why? Unless every monitor and printer in the world is perfectly calibrated, your photos are going to be slightly warmer or cooler anyway. @ John => "Every... expo discs and grey cards .. resulting fidelity." The problem John with the Expo disc is setting up for that shot quickly. With my Nikon D7000, I can save the presets for different white balances in different scenarios. I can save up to 4-5 white balance settings. When you look at all the pros, especially Bryan Peterson, white balance is key so you do not have to spend after post production. I was looking at the Nikon Facebook page and one guy said, all of you are not photographers because you are editing the pictures up the ying yang with Photoshop. Get the shot right the first time and only use Photoshop for exceptions. @ John => "Every shooter who I have recommended these to has trashed their expo discs and grey cards after they see the radical improvements in accuracy in WB and the resulting fidelity." Very interesting as I have always used a grey card even in the pre digital days.However recently I sought advice in another online group and was advised by a professional photographer it was now a waste of time using the grey card unless it was a professional type;in other words my ordinary Kodak grey card purchased for about £12.00 from a photostore would not be good enough. He was also of the opinion that AWB settings on the cameras now produced are pretty good. I have four different cameras and never used AWB they always produce a poor result for me!! The problem with 108,108, 108 (RGB color model from illuminated material is probably the printer. Most of the printers are not come with grey cartridge, the mix of color (CMY color model) to produce exact 18% grey color is impossible. Then your 18% grey card is not exactly 18% grey card and they varied from printers to printers. I use 108,108,108 for own-made 18% grey card. To make it warmer, I modify the Kelvin by setting RGB to 108, 118,118. I believe grey card is not only for WB preset, but better exposure setting. I found that Dulux Guild Grey (code PG1A5) has an LRV of exactly 18%. However, the RGB mix is not exactly neutral being R 101 G 108 B 114. I guess one can order a colour which is exactly neutral say R 108 G 108 B 108. But is a neutral color necessary? Perhaps the experts can enlighten me. Why not use the internal custom WB of your cam? I'd shoot a picture of that grey card and have this picture set the manual WB then. Last year I came across an article from Photo Techniques magazine indicating that we should be using a 13% gray card instead of 18% for accurate light metering. I was wondering if you have heard about this and have tested the idea. If yes, what were your conclusions? Also if we compared 18% and 13% to the panatone gray scale colors what would be the corresponding color numbers be? All pigments suffer from chromatic metamerisms. This results in a shift in the pigment from relative neutral that varies under different color temperatures. So a grey card calibrated for neutral at 5000Kelvin, is not guaranteed to still hold a relative-neutral under tungsten, florescent or even the extreme blue bias of open shade. The grey card will yield a shifted neutral point under these conditions and your files will still be less than ideal. Every shooter who I have recommended these to has trashed their expo discs and grey cards after they see the radical improvements in accuracy in WB and the resulting fidelity. AWB has it's place, for me, I use it for candids, grip and grins etc, and never for professional level work. Too much post-capture tweaking required. I would rather get a good WB, shoot with that until the light changes and grab another WB. Way faster than opening and correcting post-capture. But then, I would rather use my time where I make the money - shooting more photos. If I have to work post capture color, Its either costing me money, or I am making less of it. With proper WB, the only time I need to crack open photoshop is when I am enhancing beyond correct color, or fixing flaws in the skin or subject matter. If you shoot people, forget it, you have to have the WB correct else the skin tones will go all over the shop. Landscape and creative shots you tend to ease of a little. If you really need it spot on, then yes but most of the time when shooting landscapes you are after catching a certain feeling based on the overriding atmospheric light you're working in. Personally I only tend to pick out half a dozen shots from any given day out so I am happy to calibrate the monitor and then tweak the WB manually in APC on the few shots I do want to keep. I am trying very hard to not get trigger-happy with the shutter, come home with fewer wasted shots so I only do batch processing in APC when someone, like my wife, wants the whole days shots in JPG for scanning for keepers for her clip-art and family shot libraries. Something about batch processing in APC that makes me think I have way too many shots if I am doing that! @Rob Richardson: I agree. The AWB setting spoiled my photos when I covered a night event, where the light setting in different parts of the stage varied. I had to edit the pictures one by one. Much time was wasted. @Joao, From what I have seen, in the Levels Dialog, there is a grey eye dropper, use it to click on the grey card then save the settings and reload them with each photo. That is the only thing that I have seen online. @ Marco, Take one picture put it on top of the other picture in photoshop, then hide half of the one on top, revealing the one on the bottom so what you have is a split screen of the same image with both views. On one side you have the before, then on the other side you have the after. It's not two pictures, only one. by keeping everything on one picture, the differences however subtle are easier to see. Interesting post. But, what if I shoot in jpeg and use GIMP instead? Any thoughts? @ steve J -- split screen??? Why? Having one above the other works fine for me. I can have both on screen at the same time and the difference is obvious. Split screen in this narrow blog format would mean making both images much smaller with it being harder to detect the changes then. Some of us really need to calibrate their monitors!!! The temperature change in the before/after photos is not a lot, but the improvement is significant. If you cannot see the difference, you have problems with your monitor for sure and you are killing your photos in PP with inaccurate colors!!! Have a good shop print out an 8x10 print and hold it next to your monitor and compare! Other than these, (in my ignorance of WB) I have a big query on everyone's effort in trying to reproduce the exact color of the actual scene into your photograph. And my question is: How do you EVER know what the exact color in the actual scene is/ was? (unless the colors come out totally distorted, which would be a rare case for a regular photographer). What most of us are essentially trying to do is make our images pop-out or stand-out by various forms of editing it, including adjusting the WB (and not necessarily getting the WB right). For e.g. in the two images of the boy given in the article above, there is a minor difference noticeable in the skin tone. The 'after' is more warmer/ yellowish, however is that how the natural lighting was when the image was taken? Not sure. Does the 'after' image look better? Probably. However, it can be made to look even better with further editing, and I am not sure if getting the WB right will minimize the further editing. Again, I admit WB is not as simple as it looks, and my understanding of it is definitely limited. Probably responses to this comment of mine will help clarify it further. 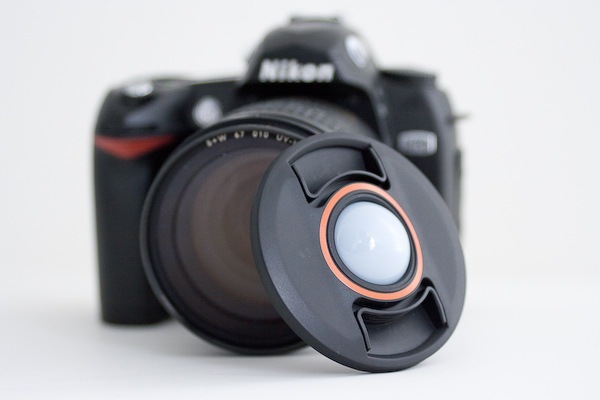 An expodisc helps get the correct white balance on the most difficult lighting situations. WIth that picture of the boy above, you really can't see a difference in the white balance at all. When it comes to outside shots, its best that you use auto white balance. But for indoors, I stress it enough, you have to use white balance your camera with an expodisc. The expodisc helps correct the lighting on all corners of the glass. What's better than a gray card is using an expodisc. I take a photo of my gray card then set it as the custom white balance. Grey card's are useless. IMO obviously. 1) have you to capture the light of moment or put all in middle-day sun colors ? 2) any hour (in light terms) has it's magic mean, don't clear this with a EVERY EQUAL COLOR LIGHT. I've tried many and many times a valid use for grey cards and only I thinks is with fabric / jewellery shots where colors must be always same and actual. However much depends by you wb camera sensibility. I'm proud how my D3/D700 get the right wb in 99% of times. Actually the wb see by my eyes. A good tip ! It's the way I proceed before shoting (AWB setting) and I'm understanding now the difference between using "auto WB" and "fixed WB". The grey cards are really good!! Now I beg to differ :) As I said above, using the grey dropper on one image with a grey card sets the temp and tint to specific values, these absolute values are applied to the set when you sync and the actual WB at time of capture does not matter as the final WB after synch is not applied relative to the capture WB. Again as I noted, getting WB close in camera does improve the "fidelity" of the on camera histogram. Beg to differ. If you are shooting a series under the same conditions, a fixed WB is the way to go. The first shot includes the gray card, and that will be used to determine the actual white balance in Camera Raw. Then if you sync the remaining shots to that, they will all have the same WB applied. If you use AWB, the assigned color temp can change from shot to shot, and even if you sync to the gray card in the first shot, the other shots could still be off. If the lighting changes significantly, then you would need to get a new gray card reading. The same would be true if you set a custom white balance. Personally, I find it faster to take a shot including a gray card rather than setting a custom white balance during shooting, but your workflow preferences may differ. The important point is, these both do the same thing -- you either set the white balance in camera, or you set it in camera raw based on a known value. Just a remark regarding the auto or fixed white balance setting. It makes no difference, both will require editing in post. If you don't want editing you should use a custom setting. Reason: auto will differ shot to shot. Preset/fixed will always asume the same color temperature, it doesn't matter whether there is a white card in the shot. Only a custom White balance will be read of the grey card. Everything else requires post processing. Before is flat. After is warm. Big difference in my opinion. I would use the gray card to get both the exposure and white balance correct before shooting instead of fixing it later in post. Yes, this is a fast one-click way (instead of adjusting them one by one), but I guess I still have the old-school "get everything right before you shoot" mentality from film. I love DPS articles, but please edit and proofread for grammar mistakes! Regarding white balance, I would love to learn more about white balance and editing skin tones. I still struggle with those issues. Thanks! There's no problem shooting AWB if you correct in post using the grey card. The white point setting in ACR overides any previous setting, and the small change you see here is because the AWB got the WB pretty close. It is good to get it close in camera as the histogram displayed by the camera is generated based on the in-camera WB and if that is a long way off it can give a histogram that is a way off as well. An alternative is to set a custom WB in your camera using the grey card - there's then no need to correct the images in post. Your camera manual will tell you how to do this. Thank you all for your comments and feedback. I have to say that I always try to set white balance on my camera so it closely matches the lighting situation and in this shoot it was not big difference between camera's white balance and retouched in PP using grey card method. But there still is a difference in white balance adjustment which makes it worthwile using. This is good to practice while you learning to understand how white balance affects your images and learning to see with your eye (or should I say adjust your eye to photographer's eye) so it can recognise straight away when WB is not right or needs adjusting. I have not covered all of the aspects of WB in this artice and it serves as a general advice but yes you have to research this method more in case you shoot in different types of situations where grey card can not be as useful. I found one error in your post. You must NOT set your WB to Auto when you are using gray card. Depending on subject you are shooting camera set on Auto WB may set different white balance on picture with and without gray card. For example shooting a scene where there is no white or gray color. Camera will set a little different WB when you put gray card on the scene, because you added new color (white, gray) in the picture. Even when you change a perspective, or subject on the same location etc. you always get a little (or not so little) different Auto WB setting. And that is a nightmare to correct. So use any fixed WB. Anything but Auto WB. I made this mistake only once and never again. Peter agree. This is what I also do. And for those who cannot see tiny difference in above photos should calibrate PC. :-) My iPhone shows very clear too. This post was sorely needed on this blog. I see a lot of (mostly beginning) photogs posting images with all kinds of effects, but their white balance is all out of whack. I think this topic should be taught immediately after the exposure triangle and basics of composition. I don't see much of a difference in the Before and After photos. Time to calibrate my monitor? But I agree, the grey card can be a very handy tool. The grey card is not just for setting your white balance, so while you have got it out why not use use it for setting your exposure. Set your camera to manual and spot meter, then take a reading from the grey card. Perfect exposure and white balance. This method is not confined to shooting in raw it can also be used for jpegs. You should never use AWB unlessyou plan to adjust the white balance in post for every shot. Why? Because AWB will constantly tweak the white balance from shot to shot. So if you use the first shot with a gray card, only that shot will be correct. It's better use ANY preset white balance because then each shot will be locked in to the same color temperature, and the gray card shot will adjust them all correctly. It might be my monitor but the after picture looks a little yellowish. Anyhow, the grey card is definitely a must have. It can be seen immediately that photo has changed even a little bit. I use X-Rite Passport Color which is good tool too. I used PS to edit and correct WB using X-Rite. As Nikon user I start postprocessing from NXView, which shows colors different than PS. I set basic only there, which is WB, shadows and eventually highlights, that's it. Unfortunately X-Rite cannot be used with NX. Then saved tiff files I open in PS to continue. ummm....I can't see a difference....wrong picture? Remember though that a grey card will give you a neutral white balance, so will counteract colours for a setting sun, so you may not want to use for your landscape photography for instance. The grey cards primary use is for accurate exposure as is the 18% grey that exposure meters are set for. Keep these things in mind when using a grey card. There's almost no difference between the two photos.